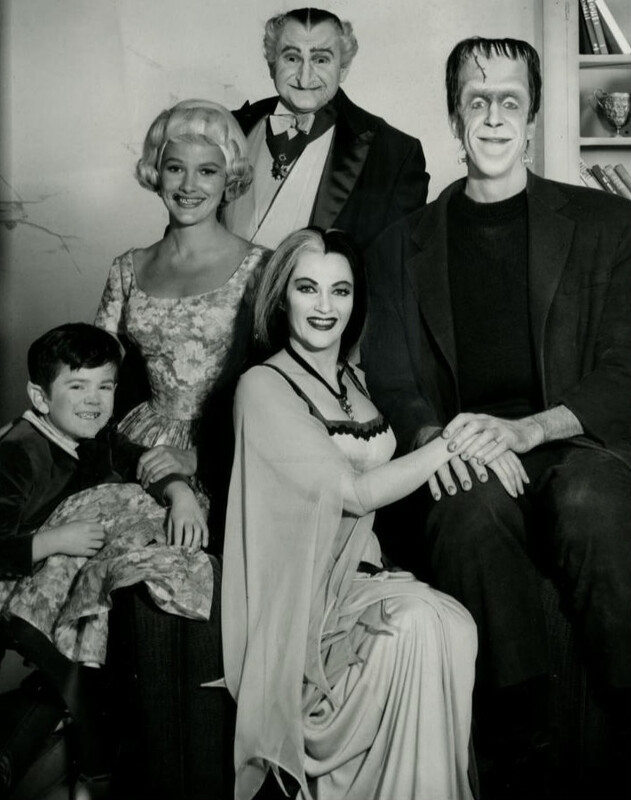 The premise for The Munsters doesn’t need much explanation; it’s about a family of old horror movie-esqe monsters. As the pilot opens, we first meet Marilyn (Beverly Owen), a normal, pretty blonde young woman, kissing her date goodnight on the front porch. Marilyn explains that the couple she lives with are her aunt and uncle, with whom she has lived since she was a baby. She frets about introducing her date, Tom, to her family, and Tom invites all of them to a party his parents are throwing. For a show about such visually startling characters, this doesn’t give any of them a particularly grand entrance. We first see Herman Munster (Fred Gwynne), a comparatively articulate and graceful version of Frankenstein’s monster, peeking out the window. Inside, we meet Lily, who looks like no more than a housewife with a hankering for the goth look (but apparently based on the Bride of Frankenstein). Although, there probably was no such thing as the goth look in 1964. We find out later in the episode that she has the power to levitate, suggesting other magic powers may also be revealed. Rounding out the family are Grandpa, apparently a petulant vampire, and Eddie, who despite an odd hairdo doesn’t immediately seem too off. The show doesn’t attempt to label or over-explain any of the characters’ dispositions. Like Marilyn, we are expected to see normal from the point of view of the Munster household. In fact, the rest of the family sees Marilyn as the strange one. Early in the pilot, Lily says of Marilyn and Tom’s courtship, “It’s amazing how some boys will overlook a girl’s appearance.” The laugh tracks come so quickly you hardly have time to decide whether to laugh at a joke on your own. The plot of the pilot revolves around the costume party. Grandpa insists on tagging along. All three adults don costumes, complaining about silly they look. Herman dresses as King Arthur, Lily as Little Bo Peep, and Grandpa as Napoleon. The costumes-on-top-of-costumes gag sets up plenty of jokes and prevents the muggle crowd from noticing anything strange. There is a nice sight gag when Herman, hidden within his suit of armor, meets Mr. Daly, who is dressed as Frankenstein’s monster. Back at the Munster house, we get a taste for how things work at home. The family cat (black, of course) growls like a wild beast, and the raven in the cuckoo clock speaks. Eddie, off screen, howls at the moon, scaring the bejeezus out of the babysitter. Marilyn doesn’t get much screen time, but she worries that her family isn’t mingling effectively with the party-goers. A misunderstanding leaves the Munsters in a snit, and heading home early. Thus we are introduced to the show’s central conflict; the Munsters’ misunderstand other people’s reactions to them, blissful in their ignorance of their abnormality. Bryan Fuller is at work on a reboot, using an hour-long format that will no doubt allow for more substance. Since Fuller writes young women so well, perhaps Marilyn will get more emphasis. (It was once rumored that he sought Kristen Bell to play her.) Also, we can probably expect a dose of the supernatural, considering Fuller’s pedigree (Dead Like Me, Pushing Daisies, Wonderfalls.) I just hope that his talent isn’t wasted on another uninspired remake, when he is such a genius with original ideas. Personally I think if he’s going to work on a remake, he would be better suited to the American version of Being Erica, but no one’s asking me. This entry was posted in 1960s, Comedies and tagged addams family, bryan fuller, dead like me, fred gwynne, kristin bell, Mockingbird Lane, munsters, Pushing Daisies, sit-com, wonderfalls by meekthegeek. Bookmark the permalink.